The last time I attempted to balance a carton of eggs on top of the lanai railing, the carton fell over. Onto the lanai floor, not into the street, if that makes any difference .... most of the eggs ended up cracked. That's the reason for the half-dozen carton in tonight's photo. I bought the eggs from a local egg layer. Lately they were running tv commercials and asides from that they have two retail outlets that they sell directly to the public. The store I stopped in is in Kaimuki. Their big sellers are the trays, at around $8.00 each, however, if you buy 2 trays, you get 1 tray of small Grade A eggs for free. 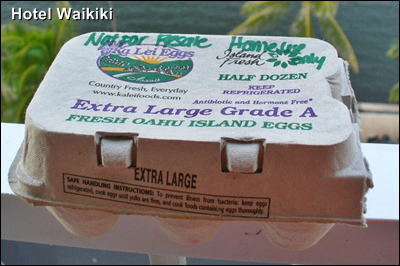 Since I was only buying the eggs to take a picture of them on the lanai railing, I bought the dozen carton instead. That's a joke, btw. I was in the Kaimuki area because I had to return an item at City Mill. When the countergirl was ready to refund me in cash, the cash register drawer refused to open for some odd reason. Huge hmmmmm. She had to call somebody else to resolve the issue electronically. Then I got my money. I know this is a dumb question... But why don't you take a photo of the eggs on the lanai floor instead of the railing? Kay- LOL, becuz great photographers don't do it that simply. Actually, it's developed into a sort of a regular feature here, albeit, as with any 'regular feature' on a blog, it can get too gimmicky. I just remembered that the dozen eggs didn't just huli over by its own. The top of the rail is beveled to the outside, but the carton balanced well for some reason. I tried taking a photo of it with the lid partially open showing the eggs waving at the viewer and a burst of tradewinds caught it and down it went. I like the photo and know exactly what you mean about making photos that pique people's interest. Like da eggs on da lanai railing. I love it! So your eggs are $8.00 a dozen back home? If I buy cage free here they're about $2.69 or so. From a local farm stand, $3.00/doz. Maybe you should buy duck eggs because my word verification is "careduck". Ahahahahaha! Mokihana- not the dozen, the trays are $8 something. That's, I forget how many total eggs, 2½ dozen perhaps. And I heard off cage free eggs. Country life must be healthy living.